The Levitating Lamp is not an illusion. The only thing between the shade and the base is air. A cleverly camouflaged magnetic disc floats more than an inch above the base and supports the lightweight lamp shade. 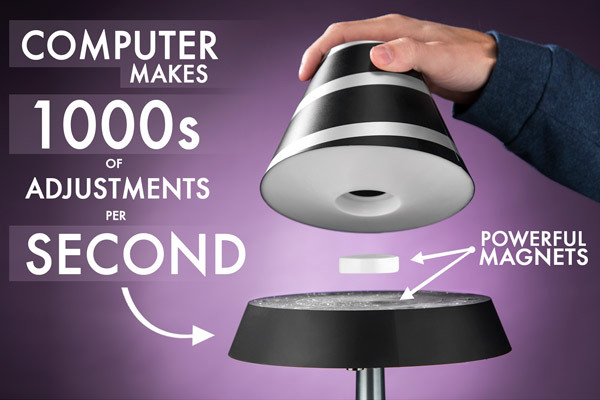 The base also houses four computerized electromagnetic coils (making thousands of adjustments per second) in order to maintain levitation even if bumped. A total of nine cool white LEDs are recessed into the base of the lamp. Six point upwards into the shade and three aim down toward the brushed metal stand. Separate touch-sensitive buttons on the underside of the base control each LED grouping. Designed for standard US outlets (120V). Note: Individuals with pacemakers should not operate this product due to its strong magnets. The remarkably cool Levitating Lamp is no trickery, no illusion. It's all science, baby! There are magnets in the base of the lamp which repel a magnetic disc that floats about 3cm above the lamp's base. The lamp shade rests upon the floating disc and creates the amazing levitating effect. Add a healthy dose of "dang, that's actually really cool" to any room with the Levitating Lamp. 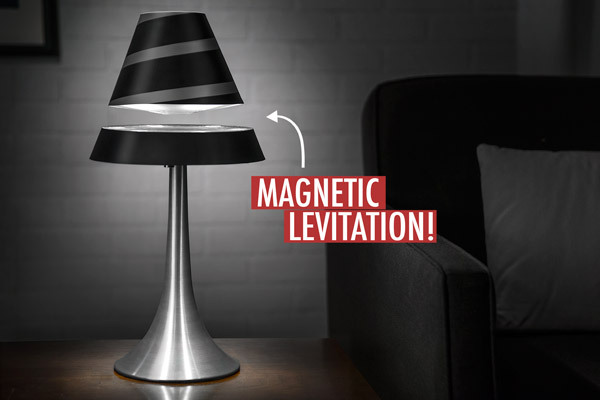 The Levitating Lamp works through the magic of magnets. 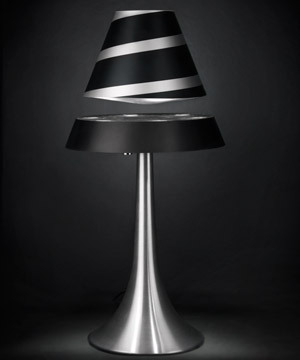 Opposing magnetic fields help levitate a magnetic disc which in turn supports the lamp shade. A set of four electromagnetic coils in the base continuously adjust the magnetic field (over one thousand times per second) to counteract accidental bumps as well as disturbances in the air. A series of powerful, computer-controlled electromagnets maintain the lamp's levitation. The Levitating Lamp houses a total of 9 LEDs. Six of them point upward and illuminate the shade. The remaining three LEDs point downward to illuminate the brushed metal stand and its surroundings. Please note: this accent lamp provides ample illumination for a desk or end table, but it won't fully illuminate an entire room. 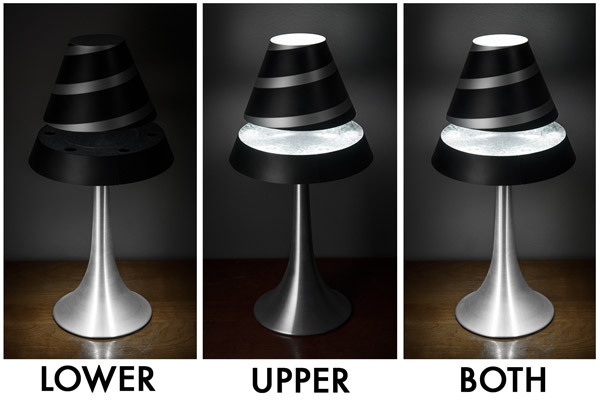 The Levitating Lamp features two separately controllable groups of LEDs. The Levitating Lamp is super easy to control. Once plugged in, just tap the two switches on the underside of the base to control the LEDs. Getting the lamp shade to float is pretty easy, too. You basically hold the magnetic disc a few inches above the base until you feel it being grabbed by the magnetic field. Then, you just let go. Easy! The manufacturers definitely know what they're doing. They've been making levitating gadgets for years. Control the upper and lower lights with the light tap of a button. Question: Is this similar to the Levitron also available on Vat19.com? Answer: Why yes! Thank you for noticing. The Levitating Lamp and the Levitron are made by the same manufacturer. The lamp incorporates much of the same technology. Question: Why is there a spiral design on the lamp shade? Answer: Two reasons. First, it looks cool. Second, it accentuates the natural tendency of floating objects to spin due to air currents. Question: I don't live in the US. Will it work with my outlets? Answer: The Levitating Lamp is designed for 120V US outlets. While outlet converters exist, we cannot guarantee that they will work properly with the Levitating Lamp. Basically, you're on your own. Question: Can I levitate other objects other than the lamp shade? Answer: Yes, you can. However, it kind of ruins the lamp effect to remove the shade. If you're looking to display your own item via levitation, check out the Levitron. Question: Is this as awesome as it looks?